The word �Satsanga� is the combination of the two words �Sat� and �Sanga.� �Sat� means existence absolute, which is Brahman. �Sat� is the essential nature of Brahman which is permanent in things that change, which is the only reality that upholds the world of appearance. The same �Sat,� with the accidental attributes of omnipresence, omniscience and omnipotence is called Isvara or Paramatman. In brief, �Sat� refers to Isvara as well as Brahman, both ultimately being the one and the same reality. �Sanga� literally means company or union. To be always in the company of the Lord, or to be established in Brahman, is the literal meaning of the word �Satsanga.� But, as long as ignorance or Avidya remains, the direct realization of Brahman is impossible. When ignorance is destroyed by wisdom, the real nature reveals itself. This is the highest Satsanga. Prana - "The true meaning of Prana is not only breath. The Prana is energy. It is universal power, brightness, light andintelligence. All these cosmic energies are named as Prana. "Yatkinchit Jagat Sarvam Drishyate Shruyatepiva..This Prana is filled in all that we see and hear, the inside and outside of all things, all movement etc. in this world. 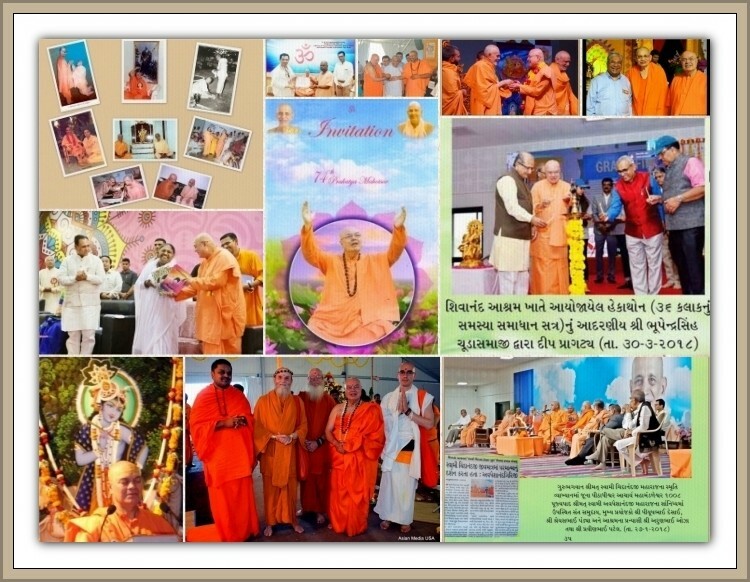 A Birthday Greetings to H. H. Sri Swami Adhyatmanandaji Maharaj ( May 3, 2018) Sivananda Ashram, Ahmedabad invites you to join with us in "Aayush Homam" & satsanga with Mahatmas organized on happy occasion of 69th Birthday Celebration of Pujya Sri Swami Adhyatmanandaji Maharaj on May 3, 2018. We pray to the Almighty Lord, Gurudev Sri Swami Sivanandaji Maharaj and Gurumaharaj Sri Swami Chidanandaji Maharaj for Pujya Swamiji�s good health and long life so that He could be a guiding light to spiritual aspirants all over. Pujya Swamiji is the embodiment of the teachings of Holy Master Sri Swami Sivanandaji Maharaj. He is a tireless karma yogi who utilizes every second of His day in rendering the highest service to Mankind. What is the difference between Bhakti and Jnana? Bhakti is devotion. It is a means to the end which is attainment of Jnana. People of emotional temperament are fit for this path. It demands self-surrender or Atma-nivedan. It is the cat-Yoga. The kitten cries aloud and the mother cat runs at once to catch it by the mouth. So also, the devotee cries aloud like Draupadi and Gajendra and the Lord Krishna runs immediately to rescue him and shower His grace. The Bhakti Marga demands only sincere, intense devotion, blind faith and strong conviction as Prahlad had. There is no necessity for learning. Illiterate people like Tukaram who could not sign even their names had realized God. There is no need for vast learning or study. A Bhakta wants to eat sugar-candy. He wants to sit by the side of the Lord. Jnana is the Yoga of self-expansion. It demands self-reliance. Only people of an intellectual temperament with Vichara Sakti or the power of discrimination and ratiocination are fit for the path of Jnana or knowledge. It is the monkey-Yoga. The young monkey does not cry, but itself clings tenaciously to the body of its mother wherever the mother runs. This Yoga demands a vast study of Vedantic literature, a sharp intellect, bold understanding, gigantic will and courage. A Jnani wants to become an embodiment of sugar-candy, instead of tasting sugar-candy. 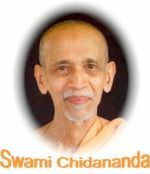 A Jnani wants to become identical with the Existence (Eka Aikyam).